Scott Jones, Alex James Ellison (front) Mark Collier, Abigail Carter-Simpson, Eve Pearson-Wright with the Aliens. 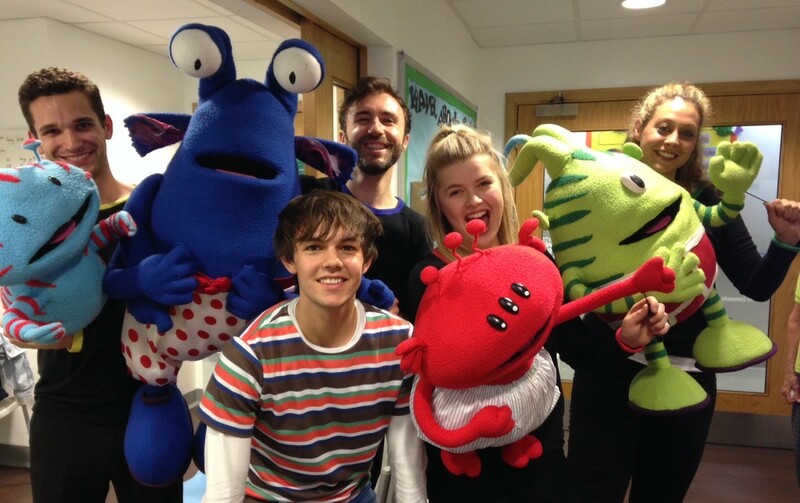 Cast members from the Dominion Theatre’s family show Aliens Love Underpants paid a special visit to the children’s wards at St Mary’s Hospital, Paddington. Arranged through Starlight Children’s Foundation, young patients from the Great Western Ward and the Paediatric Short Stay Unit had the chance to meet the show’s colourful pant-stealing aliens. They also listened to the ALU story read by cast members Abigail Carter-Simpson, Mark Collier, Alex James Ellison, Scott Jones and Eve Pearson-Wright. Based on Claire Freedman and Ben Cort’s book ALU tells the story of the mischievous aliens who come to earth on an important mission to steal everybody’s underpants. The zany and hilarious tale has been adapted and directed by Adam Bampton-Smith, with stunning effects, madcap action, original music and lots of crazy aliens. The show plays at the Dominion until September 5. Every year, Starlight provides entertainment and distraction to over half a million children in every hospital and hospice throughout the UK.